The Castro regime is an outlaw regime. 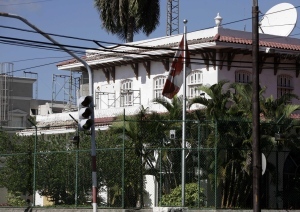 Today, another shoe dropped, the Associated Press reported that Canadian government said that at least one Canadian diplomat in Cuba has also been treated for hearing loss. "Global Affairs Canada spokeswoman Brianne Maxwell said Canadian officials 'are aware of unusual symptoms affecting Canadian and US diplomatic personnel and their families in Havana.'" Spokesperson Heather Nauert in a State Department briefing yesterday revealed that two Cuban diplomats were expelled from the United States on May 23, 2017 in response to "incidents in Cuba." According to U.S. officials five U.S. diplomats were targeted by a "sonic weapon" that led to "severe hearing loss" that led to some of them canceling their tours and returning early to the United States. The government of Cuba is an outlaw regime that has a record of not only mistreating Cubans but also engaging in actions against others that should also raise concerns. The use of a "sonic weapon" would be something new, but attempting to harm a diplomat is not. U.S. diplomat Robin Meyers was subjected to cars being used against her as weapons in Cuba on February 23-24, 1996. Former Canadian ambassador to Cuba James Bartleman told The Globe and Mail today that he was "not surprised by this week’s reports, given his experience as envoy from 1981 to 1983. Halfway through his posting, a series of strange events occurred: His family dog was poisoned, a trade officer had a dead rat nailed to their door and the embassy started receiving threatening phone calls. Fed up, he called out the Cuban government." Caught smuggling tons of weapons and ammunition in violation of UN international sanctions to North Korea on July 15, 2013. A 2014 United Nations report revealed that 240 tons of weapons hidden under bags of sugar in 25 standard shipping containers (16 forty-foot and 9 twenty-foot) and 6 trailers that included surface to air missile systems, dismantled Cuban MiGs, and "some of the ... parts could also meet the criteria defined in the list of ... technology related to ballistic missile programmes." The Castro regime was again linked to international drug trafficking this time with client state Venezuela on January 27, 2015. The Cuban dictatorship has been engaged with drug trafficking rings for at least four decades. The Cuban government also helps orchestrate an immigration fraud network through Venezuela that has smuggled radical Islamists into North America, reported in the Center for a Secure Free Society’s “Canada on Guard” report. In 2014 an inert US Hellfire missile sent to Europe for a training exercise ended up in Cuba. At the time in secret negotiations, to normalize relations, the United States repeatedly asked the Cuban dictatorship to return the missile but did not until a month after it became public in January of 2016. Castro was again caught smuggling heavy weapons and ammunition through Colombia that are the same kind used by communist guerrillas in that country on February 28, 2015. In April of 2016 the Castro regime was caught "red handed" by Panamanian officials with 882 pounds of cocaine on a Cuban freighter bound for Belgium. Thousands of Cuban military advisers and intelligence officials are assisting the Maduro regime to further consolidate power to entrench the dictatorship in Venezuela. The OAS Secretary General described it last month as "being like an occupation army." Cuban intelligence agents who have murdered nonviolent dissidents and engaged in promoting terrorism abroad are more than capable of harming diplomats and should not be a surprise. What is shocking is that many journalists are and should know better. Then again looking at what has happened with the shuttering of the Institute for Cuban and Cuban American Studies at the University of Miami to get along with the Castro regime we should also not be surprised at the ignorance about the nature of the dictatorship in Cuba.